Winning NBC’s “America’s Got Talent” at just 12-years old by the most votes for a final performance in the history of the show, singer/ventriloquist Darci Lynne Farmer impresses audiences across the country with her sweetheart disposition and undeniable, show-stopping talent beyond her years. Accompanied by her musical friends including a divaesque rabbit: Petunia, a shy and soulful mouse: Oscar and a sarcastic old woman: Edna. Singing through her friends helped the young entertainer find a voice inside she didn’t know she had, and helped her overcome a lifelong struggle with shyness. An Oklahoma native, Darci began participating in talent-based pageants at a young age, and picked up ventriloquism shortly after. Two weeks later, Darci began tackling talent shows, eventually making it to the biggest talent show on television, NBC’s “America’s Got Talent.” Following her big win, she has been featured on NBC’s “Little Big Shots,” Food Network’s “Kids Baking Championship,” “Ellen” and “TODAY.” Her first Christmas special “Darci Lynne: My Hometown Christmas” will air on NBC this December. 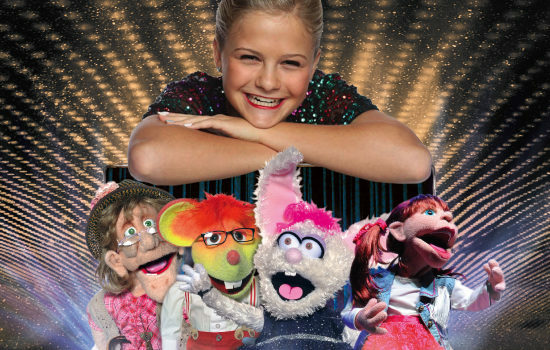 Darci and her friends are continually on the road bringing smiles to audiences across the country. In 2019 Darci will hit the road for her Fresh Out of the Box Tour. For dates and the latest information, visit www.darcilynne.com.